Hummingbird Kitchen "The Smotherload" Waffle fries with Nueske's bacon, cheddar cheese, sour cream and scallions, $7. 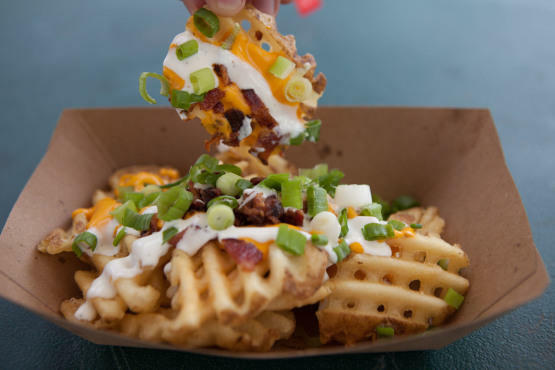 The best item we ate, the waffle fries are crispy and topped with cheddar sauce and smoky bacon. Plus, unlike many other items we tried, you can eat them while walking around. Brunkow Cheese Queijo de Coalho: Brazilian-style grilled cheese on a stick with black rum maple syrup, $3. While we liked this idea in conception, in actuality, just one bite of the heavy cheese was more than enough. The cheese is similar to Finland's Juustoleipa, or bread cheese. Brunkow also makes a chile and pepper jelly version, a bacon and pineapple, and a pizza flavor. Porkchop Baby back ribs, $8. Unless you want to walk around gnawing at a hunk of meat and wind up coated with sickly sweet BBQ sauce, get a plastic fork and knife, sit down and cut these ribs up. Or, better yet, don't order them. The meat is flavorless, and dumping BBQ sauce on top isn't enough to save them. The Salsa Truck Rajas tacos, $6. In an effort to try more vegetarian items, we ordered the rajas tacos. Don't. Get the carne asada tacos, because the rajas are merely a large serving of peppers and onions topped with spicy salsa and cilantro. There's little in the way of texture and while the really spicy sauce is a nice touch, it's not enough to make us want to order these again. Bar Toma Margherita pizza with mozzarella, tomato sauce and basil, $8. Quickly fired in a mobile pizza truck, the individual size pie features mozzarella that's so creamy that it melds with the piquant tomatoes to create a rich sauce. The crust is chewy and you can fold the whole thing in half so it's easier to eat. Kamehachi Spicy crab seaweed wrap, $5. We're not sure why this is called a "spicy crab seaweed wrap," because it's actually just a crab maki roll. For $5, though, it's not a bad option-it's easy to eat and is a step up from sticky grocery store sushi. Chubby Wieners Veggie dog, $7 Three cheers for the Chicago-style hot dog, because the abundance of toppings can mask even a subpar dog. The dog has a vaguely meaty flavor, but when you consider the toppings, this is a pretty decent option for vegetarians. Original Rainbow Cone Rainbow cone, $5. Can there be a Chicago festival that doesn't include the Rainbow Cone? While the cone started melting immediately, it's still a good dessert choice. The cone layers chocolate, strawberry, Palmer House (vanilla with cherries and walnuts), pistachio and orange sherbet. You can also get it served in a dish, which may be a better choice for staying clean during the fest. Gale�s Root Beer Gale's root beer float, $6. Pastry chef Gale Gand makes this root beer, which has a nice balance of vanilla and ginger, and works very well with vanilla ice cream. The only downside is that it's served with a straw that has a teensy spoon on one end-grab a real spoon from another stand and dig in. Farmers market area in Grant Park at Lollapalooza Music Festival 2013 on Friday, August 2nd. Franks N Dawgs Bacon mac 'n' cheese dog, $9. One of the best items we had, the sausage is made with bacon, topped with a pile of truffle mac and cheese and nestled in a buttery brioche bun. It's very rich, so you'll probably want to share with someone. This isn't just good festival food-this is good food, period. Big Fork Bacon sausage on a stick, $5. There's juicy sausage and there's greasy sausage. Big Fork's bacon sausage is the latter, and we're writing this now, covered in grease. It's served with Local Folks BBQ sauce spiked with whiskey. Puffs of Doom Salted Caramel Hot Chocolate Cream Puff, $5. You'll need a lot of napkins for this very large cream puff, which is filled with hot chocolate cream and topped with salted caramel sauce. The pastry itself isn't sweet, so there's a nice balance with the caramel and chocolate. Food available in Grant Park at Lollapalooza Music Festival 2013 on Friday, August 2nd. Food available in Grant Park at Lollapalooza Music Festival 2013 on Friday, August 2nd. Or, well, the remnants of it. Chef Graham Elliot assembles the line-up of Chow Town food vendors at Lollapalooza, and this year there are 43 vendors selling everything from bacon sausage on a stick to vegan tamales to cream puffs. The vendors are mostly divided between Chow Town North and Chow Town South, located right in the middle of the festival grounds. Plus there's a Farmers Market section, which is kind of a misnomer, since it's mostly more cooked food, plus Seedling, which sells individual apples and bags of fruit. We just got back from sampling 13 different items—our favorites were the bacon dog with truffle mac and cheese from Franks N Dawgs, waffle fries with cheese, bacon, sour cream and scallions from Hummingbird Kitchen and Gale's Root Beer root beer float. While there were a few misses, overall, the food line-up at Lolla puts the Taste of Chicago to shame.